The Ebola virus is striking fear into many hearts because of its high mortality rate and no licensed cure as yet. Given below is everything you need to know about Ebola virus to be able to carry out an intelligent conversation about it. The first Ebola virus outbreak was in 1976. This was when the virus was discovered. The current Ebola virus outbreak started in West Africa. The disease spread now spans Sierra Leone, Senegal, Nigeria, Liberia and Guinea. More than 8000 people have been diagnosed with the Ebola virus since March of 2014. The number of people who have died in Africa from the disease is approximately 4000. According to the World Health Organization, 416 health workers have contracted the virus and 233 have died as a result. This may be due to improper use of protective equipment or poor hygiene practices. 16 cases of Ebola Virus Disease (EVD) have been reported outside of Africa. These are mostly people who were transported from Africa after contracting the disease. There are two cases of nurses acquiring the disease from treating EVD patients flown in from Africa for treatment – one in Dallas, US and the other in Madrid, Spain. 5 Americans were infected with the virus in West Africa and were flown into the US for treatment. The outbreak seems to have been contained in Nigeria through due diligence and precautions. The Ebola virus is primarily present in fruit bats. Consuming or touching food that has bat droppings or saliva on them may infect humans. It is important to thoroughly cook any food that might have been infected in such a way before it is consumed. Once the infection has spread to a human, he/she can pass it on if special precautions are not taken. The primary mode of infection is through contact with the bodily fluids of someone infected with the virus. However, the virus is only spread through a person if he/she is showing symptoms of EVD. A person is not infectious following exposure to the virus, until the first symptoms of the disease show up. A person does remain infectious following a few months after recovering from the disease though. The virus is also present on a person’s skin after symptoms emerge, which is why contact with the person should be limited and caregivers should wear protective gloves, goggles and clothing. 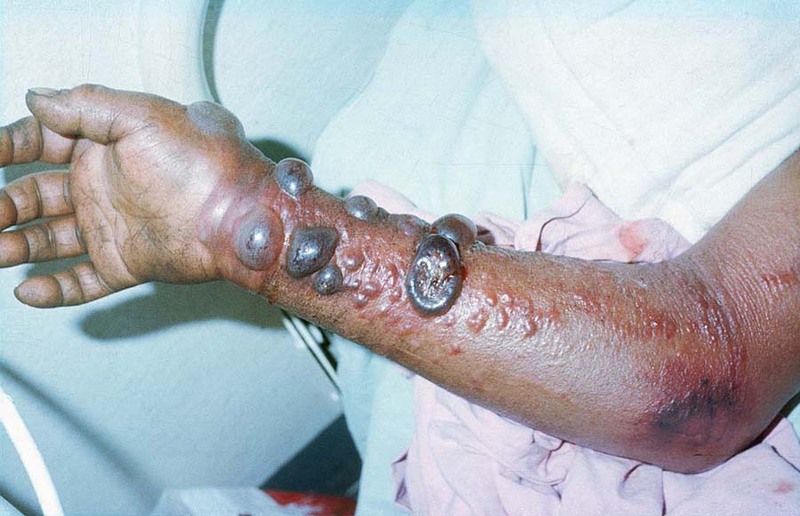 The symptoms of Ebola virus in humans show up eight to ten days after a person is exposed to the virus. In some people, it may take up to twenty-one days for symptoms to develop, which is why anyone at risk of infection is monitored for at least 21 days. The first symptoms to develop are similar to those accompanying flu. Infected people may run a fever and complain of headaches and aching muscles. Sometimes, a rash accompanies this. As the virus grows in the body, patients start experiencing diarrhea and vomiting. It is very important to keep a person hydrated at this point. If the infection worsens, there may be internal and external bleeding. This may lead to blood in vomit and stools, or bleeding from eyes and mouth. Internal bleeding may cause vital organs like the heart and liver to start failing.